[The people sent by the Jewish leaders to John the Baptizer said,] "Then who are you? We need an answer for those who sent us. What do you have to say about yourself?" John replied in the words of the prophet Isaiah: "I am a voice shouting in the wilderness, 'Clear the way for the Lord's coming!'" John let the questioners know that his identity was not the issue; the one about whom he spoke was the important issue. Yes, John's coming was an answer to prophecy. Yes, John's ministry was powerful and touched many people. Yes, John's work changed an untold number of lives. Yes, John's presence was a signal about God's coming Kingdom. John, however, always kept his role in perspective: He effectively said, "I'm here to point the way to the Messiah. 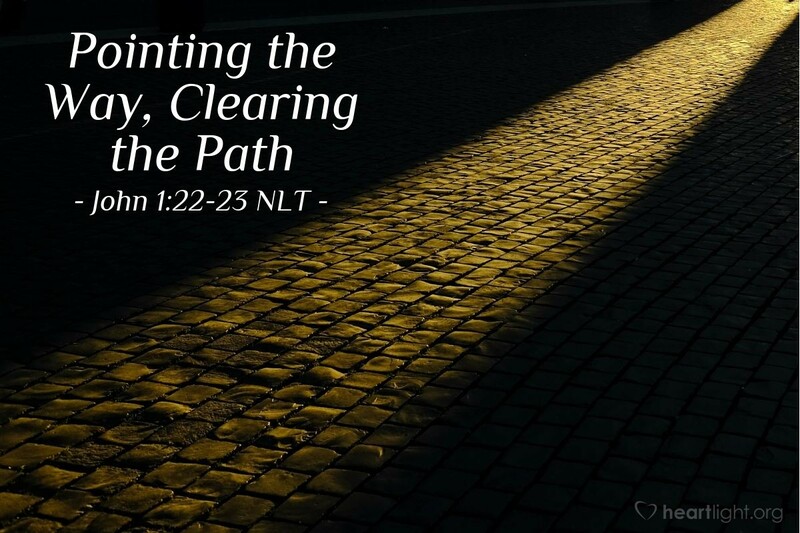 My role is to clear the path for people to find the Lord." No matter what our gifts may be, no matter what talents God has given to us, each of us in our own way is called to follow John's example. We have been put into a circle of friends, family, and acquaintances to point the way to the Messiah and clear a path for those we know to find the Lord. Precious and loving Father, King of the ages and Lord of my heart, please use me to bring others to know Jesus as their Savior and Lord. I especially ask that you give me wisdom as I seek to be a faithful witness to your Son's grace with the following people:... In the mighty name of Jesus, I pray. Amen.